From Henry Selick, visionary director of "The Nightmare Before Christmas," and based on Neil Gaiman's international best-selling book, comes a spectacular stop-motion animated adventure – the first to be originally filmed in 3D! Imagination is a very powerful thing – it can bring you to places which you can only, well, imagine. Imagination is also a very dangerous thing – it can transport you to realms so terrifying, you will wish you never, well, imagined about them. And imagination can often be visualised with the help of movies – animated movies, in fact. Just look at where animated pictures like The Nightmare Before Christmas (1993) and Corpse Bride (2005) have brought its viewers to. A land where ghouls and skeletons look chic and appealing? That can only happen in animated movies. And here we have another film which transports us to a world, well, two worlds to be precise, which promise to give you a viewing experience you’d never forget. As if Henry Selick didn’t impress the world enough with his Jack Skellington in The Nightmare Before Christmas, he joins forces with the mighty Neil Geiman to bring his graphic novel to screen. If you find Lewis Carroll’s Alice in Wonderland weird, this tale will probably blow your minds away. 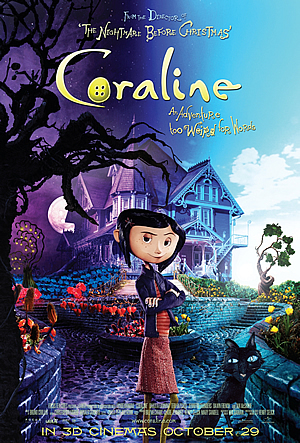 The titular Coraline (she keeps telling people it’s "Coraline", not "Caroline") is a young girl who walks through a secret passageway in her new house and uncovers an alternate version of her life, a version so alternative that it brings her on an adventure she’ll never have imagined. This parallel universe is eerily alike her life, only much better. 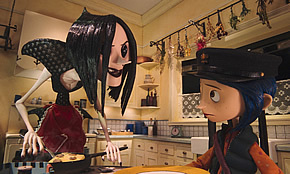 But things take a turn and her alter-life becomes dangerous, and she may face the fate of staying stuck at the other side of the door forever, Will Coraline get back home in time? Will she save her family in time? And most importantly, will she lead the happier life she has always wanted to? You know the answer to all these. And although you know there will be a happy ending, you don’t mind sitting through the 100 minutes of thrills and spills. It is even more fabulous in 3D – climbing through the hypnotically purple passageway with Coraline, seeing objects fly towards you in a beautifully adorned concert hall, falling into a spider web trap where things look too creepy to be true (our friends at the censorship board gave a consumer rating of "Some Scary Images" to this production, and trust us, they actually make sense). These and more are just some of the images brilliantly conjured up by imagination. 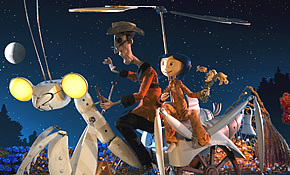 This is the result of some very impressive state of the art stop motion animation. Of course, the engaging and ingenious creativity of Gaiman’s story was the anchor for this. The result is a compelling watch that is not short on sophistication. 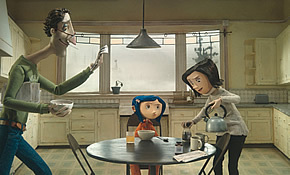 Identify the symbolisms of objects and the cautionary message the filmmakers have instilled in this clever family movie. So never mind that the filmmakers gathered some impressive voice actors like Dakota Fanning, Teri Hatcher, Jennifer Saunders and Ian McShane to voice some out of this world characters like 'The Other Mother' (Hatcher), a frumpy old gramps and a talking black cat. Yes, these are characters that would only appeal in the world of animation. The inventiveness of this movie is pitch-perfect. You’d actually believe that you are going on this perilously exciting adventure with Coraline, and you know that you will be getting home in time for your mother to tuck you into bed.